In a battle of undefeated fighters in which 20 year old Filipino John Vincent Moralde stunned favored 23 year old Australian Brayd Smith to win the WBC Asia Boxing Council Continental featherweight title in Smith’s hometown of Toowoomba, Queensland on Saturday, Smith was flown to a hospital in Brisbane after he collapsed while talking to some friends 30 minutes after the fight. Maniatis said Smith who is a lawyer, complained of a headache and collapsed and was rushed to Brisbane on a helicopter ambulance. Maniatis said Smith had a blood clot in his brain. 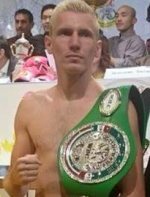 Moralde and his team didn’t know about the tragic situation of Smith whose manager/agent Brendon Smith is also the trainer of Michael Katsidis, as they were en route back to the Philippines. It was Moralde’s first fight abroad but the promising youngster who is handled by youthful Jim Claude Manangquil showed no signs of nerves as he out-boxed Smith who was a noted puncher but couldn’t land a big shot while Moralde nailed the more experienced Aussie with some excellent combinations. Moralde received the nod of all three judges by wide margins of 99-91, 98-92 and 97-93.